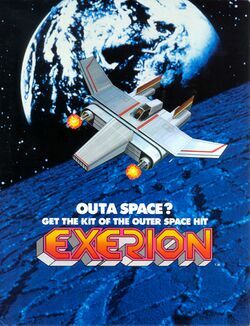 Exerion is a shoot 'em up game developed by Jaleco that features parallax effects and inertia simulation, something notable for 1983. The player travels around strange scenarios shooting aliens. The player has two types of guns: Fast single shot (limited) or slow double shot (unlimited). After every few stages, the player was presented with a bonus stage. It was never release for home consoles outside of Japan. It was converted for play on the Famicom where it retained most of the features found in the arcade. A graphically limited conversion was also produced for the Sega SG-1000 and the MSX. The MSX received a sequel to the game entitled Zorni Exerion II that brought the graphics quality closer to the arcade. The game was later contained in Jaleco Collection Vol. 1 for the PlayStation in 2003, and in Jajamaru Jr Denshouki Jaleco Memorial for the Game Boy Advance in 2004. Joystick: Use the joystick to move the ship in any one of eight directions. The ship is capable of moving to any location on the visible screen. The ship is influenced by momentum, so it will not instantly turn back in the opposite direction. It must overcome the inertia of its current direction first. Fire A: Press the first fire button to shoot twin bullets in an upward direction. You have an unlimited supply of these shots. Fire B: Press the second fire button to launch a rapid consecutive fire of single bullets. You have a limited supply of these shots, as indicated by the charge count at the bottom of the screen. Exerion is a vertical shooter that is operated with an 8 direction joystick and two fire buttons. The game's biggest features are the parallax scrolling which occurs in the background, and the sensation of inertia that is applied to the motion of the ship. The ship is equipped with two kinds of weapons. You can fire the dual shot gun which can only release one pair of shots on the screen at a time, but has an unlimited supply, by tapping the first fire button. The single shot gun can fire a rapid stream of shots on the screen at one time by holding the second fire button down, but it is limited in ammo according to the number of charges indicated on the bottom. Each weapon is best used in different situations, in order to defeat the enemies which come flying down from the top part of the screen. Due to the inertia of the ship, you must input any reverse in direction much sooner in order to cancel the ships momentum. This was not a common feature for similar games that came out around the same time, so it distinguished Exerion from other shooters. Because the Famicom conversion was played on a horizontal screen, the enemies appeared much closer to the player's ship, which changes the feel of the game since you have to react to the enemies' location much sooner. Hint : To get a high score, if you do not miss any shots your bonus score will keep on doubling to 10000 then reset to 000. When at 10000 miss a shot then bonus score will revert to 5000. Hint : When fire from the double shot (slower) weapon hits an enemy, it re-charges the faster single shot weapon. To keep the single shot re-charged it is possible to fire both weapons at once by tapping both fire buttons, maintaining charge, giving a higher rate of fire and more chance of hitting enemies. Bug : In the challenge stage, if you shoot all 40 aliens you normally get a bonus charge of 60. Sometimes a red hydra comes out during this stage. If you shoot it and all 40 aliens, you get a total of 41. The game seems to fail the test of 'hits=40' and only gives you a bonus charge of 41. This page was last edited on 14 January 2012, at 01:10. This page has been accessed 11,000 times.